After a few days of being at home resting, I was keen to get out and about with both Farley and Hallie. Braino had gone back to work but Mum was still staying with us so I had an extra set of hands to help navigate taking both toddler and newborn out for the day. I was thinking of going to the Brickman Awesome Exhibit at the Sydney Convention Center but the thought of traveling in to the city felt a little ambitious. I remembered that Rouse Hill House and Farm also has an interactive LEGO® display and decided it would be a good alternative. It oddly combined two things I'm interested in - LEGO® and historic homes! Rouse Hill House and Farm is a 200 year old property that is part of the Sydney Living Museums network. The LEGO exhibit is located in the visitor centre and features a detailed LEGO® model of Rouse Hill House and the surrounding buildings, built by the Southern Hemisphere’s only LEGO®-certified professional, Australia’s Ryan McNaught, as well as the opportunity for kids to explore and build their own LEGO® creations. There is also DUPLO® and MEGA BLOCKS for younger kids. I would highly recommend it as a toddler friendly activity. Farley enjoyed looking at the LEGO® model of Rouse Hill House and loved playing with all the different styles of LEGO®. It kept her entertained for longer than I expected. Hallie had a feed and then slept the whole time while I wore her in the baby wrap. It’s in a comfortable air conditioned room which makes it a great option for a rainy or really hot day. The staff member who was co-ordinating the LEGO® exhibit was lovely and overall the display was well co-ordinated. You can pre book one of 3 hour long session throughout the day and number for each session are kept to a minimum, which gave each kid enough space to do their own thing. Also at Rouse Hill House and Farm you can take a tour of the farmyard, the house or the school house. We actually arrived a little too late for the farmyard tour but we did do the house tour, many for my enjoyment ( I'm a bit of a geek when it comes to abandoned buildings and historic homes ) however I wouldn’t recommend it with a toddler. The house is literally filled with antiques and is in a state of arrested decay. On the guided tour we were instructed to not touch anything, which is a challenge for a two year old, so Mum carried Farley the whole time but she naturally got very bored and squirmy. The house tour is not pram friendly but a baby or toddler in a carrier would be ok. We decided to give the following tour of the school house a miss but I imagine the farmyard tour would be more appropriate for toddlers. Getting there: Rouse Hill is a bit of hike from the city but it’s not too far if your in Sydney’s north or west. Driving is the best option and there was plenty of free parking on site. More info on getting to Rouse Hill House and Farm can be found here. Cost: Entry for the Rouse Hill House and Farm in LEGO® BRICK exhibit is $12 for adults, $8 for concessions and kids under 5 are free. This admission prices includes the tours of the property as well. Pram Friendly? : The LEGO® exhibit is in the visitor centre and access is pram friendly. 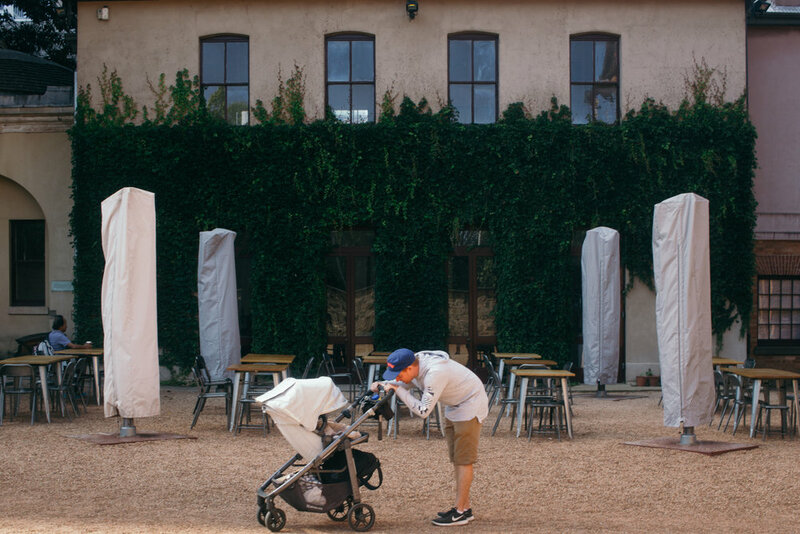 We were able to take our pram right into the room however, during busier times, prams are required to be left on the deck. The tours are not particular pram friendly. The grounds of the property are quite large and the tour groups leave from the visitor centre in an extra large golf buggy. Prams can be left at the visitor centre but I'd recommended backing a carrier for babies. Baby change facilities: There was a large disabled toilet with a baby change table located in the visitor centre. Sun protection: The LEGO exhibit is indoors but if you do take one of the guided tours, I'd recommend backing a sun protective gear as the grounds are large and sunny. 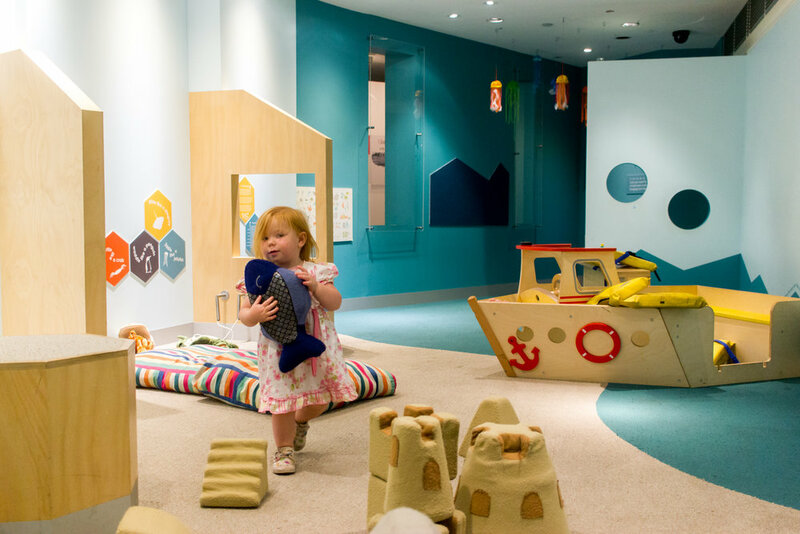 Wannabees Family Play Town at Hornsby Westfield would have to be one of our favourite indoor activities. We have been there twice now ( well Farley has been three times, once with Gran while I got a hair cut) , it’s a wonderful, toddler friendly, interactive experience. If you’re not familiar with Wannabees, it’s a unique play centre that provides custom made spaces for kids to dress up and engage in imaginative role play. There is everything from a police stations to a beauty salon, fire station, post office, hospital and vet, even a TV studio and radio stations. Kids are free to explore on their own or they can join one of the staff directed activities that are hosted throughout the day. 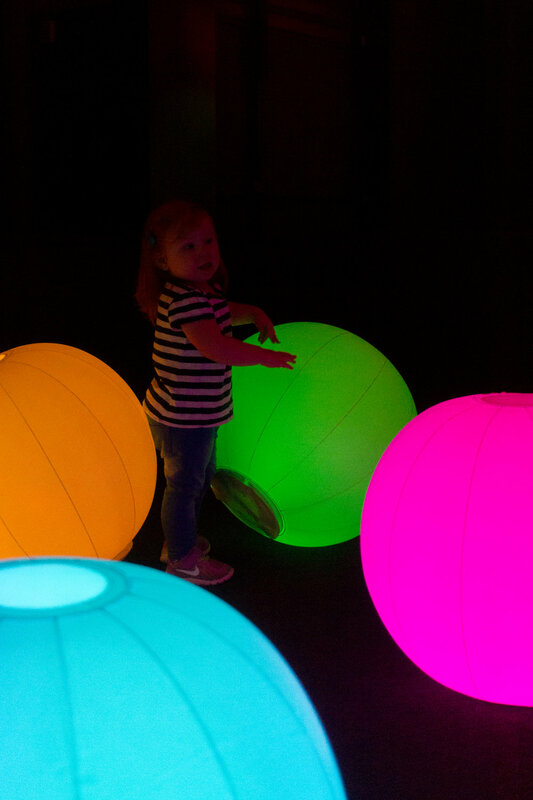 While it’s aimed at kids of all ages, it's a great learning experience for toddlers, who will love touching and exploring all the areas and activities. However I would recommend avoiding weekends and school holidays when it’s likely to be busy with older school aged kids. The first time, I went with a group of mums from playgroup on a weekday and it was perfect! We basically had the place to ourselves and our littles ones had free range. This time, we went on a Saturday, during school holidays and while it wasn’t too chaotic, there were a lot more older kids to navigate around. There are also dance discos and fashion parades through out the day on the concert stage. If you do have a baby along for the fun, there is a designated small soft play area that is suitable for babies who aren’t walking yet. I think I’ll definitely be back a few more times once our new baby arrives. There is a cafe on site and you can book rooms for parties. There is also a drop and shop option where older kids can play while you do the shopping. Head to the website for more information. Where: There are two Wannabees Family Playtowns in Syndney. I’ve been to the Hornsby location, which is the newer of the two. The other is in Frenchs Forest. When: Wannabees is open 7 days a week - check the website for specific times. 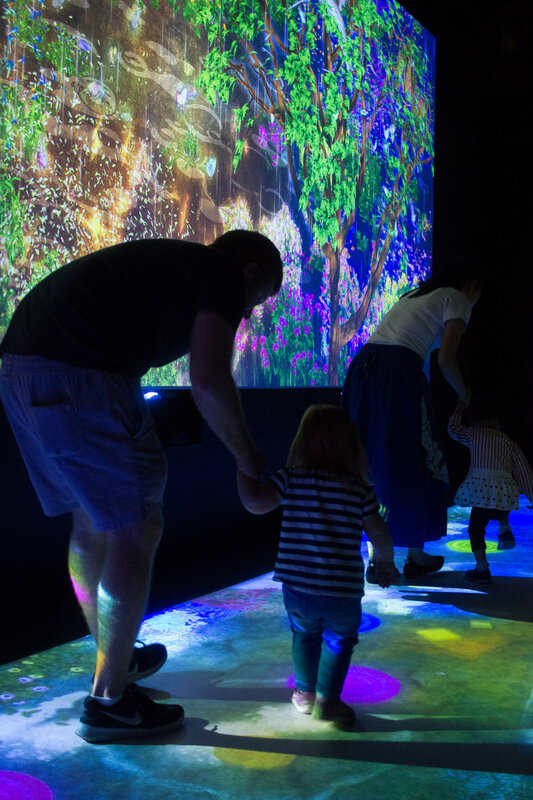 I’m always on the look out for family friendly museum exhibits; they are such an amazing way to expose your little one to new sensory experiences and learning opportunities. I had recently read about the new Arctic Voices exhibit at the Australian National Maritime Museum and thought it would be a perfect day out. Farley is currently very interested in anything aquatic - sea creatures, boats, particularly octopuses and I thought learning about the Arctic could perhaps expand on this fascination. And while she did enjoy the polar bear and whales of the Arctic Voices exhibit, it was the Mini Mariners Under 5's Play Area that was the true highlight of the day. Arctic Voices is an interactive exhibit designed to explore the fragile and rapidly changing environment of the Arctic. It’s filled with lots of hands on, digital displays that will captive kids (and adults) of all ages. While I would say it’s targeted towards school aged kids, there was certainly enough there to keep Farley engaged. She particularly liked the digital interactive game where you help a killer whale through a maze of ice and she also enjoyed seeing the life size Polar Bears. Afterwards, we headed down to the Mini Mariner’s Under 5s Play Area which was perfect for a little two year old! Much to Farley’s delight, the area was filled with octopuses, sea horses, starfish, shells and boats. She loved the big soft puzzle pieces and played in the mini boat whilst wearing a life jacket. So adorable! There was also books, hand puppets, soft sandcastle blocks and we had the space all to ourselves! Overall all, I was really quite surprised at how much there is to see and do at the Australian National Maritime Museum. While it was a great day out for a 2 year old, it really would be a jam packed experience for families with older kids. There is an incredible fleet of ships you can explore however, due to safety reasons, you can't go on whilst carrying a baby or child under a certain height. Check out their website for more information on what’s on for kids. I’m keen to head back and check out the Under 5’s Summer Sessions and the Cabinet of Curiosities Touch Trolley. Getting there: I caught the train into Town Hall Station and walked to Darling Harbour which was an easy 20 minute walk through the city. However, Pyrmont ferry stop is right next to the museum (which would actually be a great way to continue the nautical theme of your day) More info on parking and buses can be found on the website here. Pram friendly: Yes, I took Farley in the pram and found it very easy to get around. There were plenty of ramps, didn't need to use any lifts, and it was rather spacious. We visited on a weekday at the start of the school holidays but perhaps weekends could be a bit busy. Cost: If you’re just heading in to see the Arctic Voices exhibit and the other permanent displays - adults are $20, kids are $12.00 and kids under 4 are free. Or you can purchase a Big Ticket which will allow you entry onto all the fleets of ships then it’s $32 for adults and $20 for kids. More information on admission here. I'm always on the hunt for kid orientated museum exhibits so I was quite excited about Alphabetical Sydney : Creative Lab at the Sydney Museum. It was the perfect morning out for Farley and myy sister in law, Lauren, was also visiting from Brisbane for the weekend so it made for a wonderful Sydney themed family outing. Tiny Tots is a wonderful educational playgroup geared towards baby and toddlers 9 months - 3 years. We attended during the Dinosaur Discovery month and even though Dorothy was no where in sight, Farley loved it!